E. Warner was among the most prolific printmakers of the 1920s and 30s, exhibiting with the Australian Painter-Etchers' Society from 1923 as well as holding several solo exhibitions. 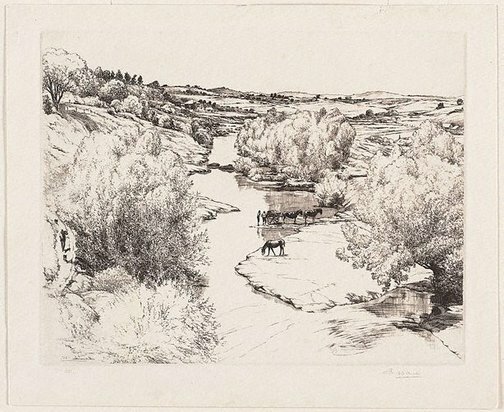 His etchings and bookplates were frequently reproduced in 'Art in Australia' during the period, and he also made etchings under the pseudonyms G Marler, J Dodd, C Jack and Breuton. In addition, Warner produced colour woodcuts in collaboration with his brother, signed 'The Warners'. Warner favoured landscapes, cityscapes and images of bush life, often with an emphasis on rural labour. 'Shifting gravel' is typical of Warner's etchings of the time, printed from a cleanwiped plate to produce a sharp contrast between the clean black of the etched line and the white of the paper lending the work a sun-bleached, almost photographic quality. Signed l.r. corner, pencil "E. Warner". Signed and dated within plate to print l.l. in reverse, "E Warner '35".